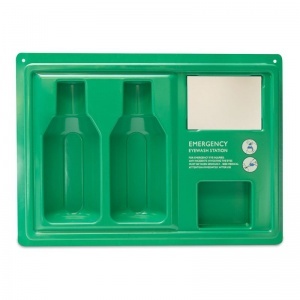 For basic storing of eye washing essentials in case of chemical splash or injury, the Emergency Eye Wash Station (Empty Case) provides you with a sturdy display container to easily reach your first aid products. In workplaces that deal with chemicals, having an effective eye-wash station is absolutely essential. To do this, it is important to have a sturdy and visible station that is accessible when needed. This high visibility eye wash station is capable of holding two 500ml saline solution eye washes and two eye pad dressings for effective eye treatment when encountering foreign objects or chemical splashes to the eyes. Employees will always feel safe with one of these cases displayed around the work space. The case has been designed for wall mounting so that the items contained in it can be easily spotted and reached in the event of an emergency. The mirror has been installed for straightforward self treatment, with clear instructions printed beneath it for easy to read safety guidelines. The Emergency Eye Wash Station (Empty Case) is usually dispatched via First Class Royal Mail and delivery should be within 1 to 3 working days.